Apple co-founder Steve Jobs' vision of spaceship-styled new headquarters is one step closer to reality with this incredible drone flyover showing the mega project's construction progress. 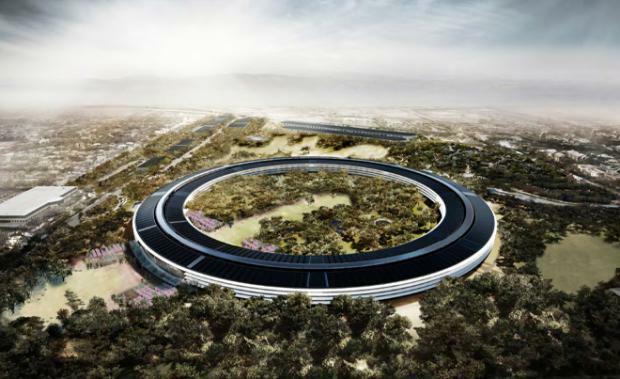 The 2.8 million square foot (280,000 square metre) Cupertino, California-facility, designed by renowned British architect Sir Norman Foster and estimated to cost in excess of US$5 billion, is rumoured to be scheduled for completion in 2017. The flyover video, taken by Californian local Matthew Roberts, one of a few drone owners who uploads videos to YouTube each month, depicts a campus that is still far from complete, but it appears to be making progress quite rapidly. On completion, the new campus will house 12,000 employees, feature more than 7,000 trees and 700,000 square feet (70,000 square metres) of solar panels. Located within the campus' spaceship building is a 1,000-seat auditorium and 100,000 square foot (100,00 square metres) fitness center. Want to know more? Here's 6 incredible facts about the new Apple Campus. The building is more than a mile (1.6km) in length. There will be 300,000 square feet (300,000 square metres) of research facilities and underground parking. According to a Bloomberg interview with Peter Arbour, an architect for Seele, the company behind the glass staircases in Apple stores globally, there is "something like six kilometres of glass." The original contractors, Skanska and DPR, were fired from the Campus 2 project in early 2015 and replaced by Rudolph and Sletten & Holder Construction, costing Skanska around $800 million in lost revenue. The power for the campus will be generated by an "on-site low carbon central plant" with Apply intending to utilise alternative energy sources as part of its pledge to use 100 percent renewable energy at its facilities. According to Apple VP of Environmental Initiatives Lisa Jackson, 80 percent of the site will be dedicated to "green space"